I can’t wait to share this deliciously satisfying Migas recipe with you. It is a breakfast I have been making since waaaay before I met Mr. Fearless Dining…but I will save that story for another day :-). Migas are considered a traditional Mexican breakfast where you cook corn tortillas and then scramble in eggs and other ingredients in. I have always included chorizo because it adds so much flavor to this dish. If I don’t include chorizo, my son complains because he shares my love of Mexican food :-). 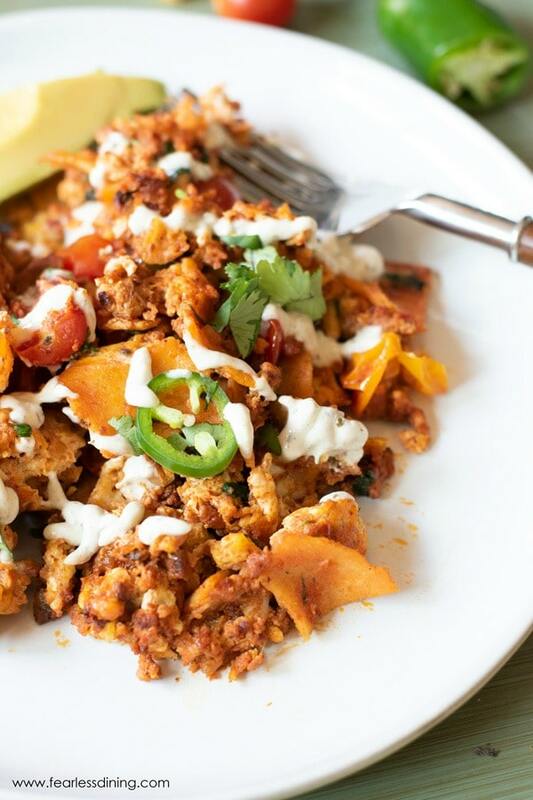 The heroes of today’s tasty breakfast are delicious fresh ingredients like Pork Chorizo, Panela Cheese, and their Cilantro Lime Sour Cream! These ingredients help make Mexican recipes so good that you can savor the flavors of Mexican food without spending a huge amount of time in the kitchen! 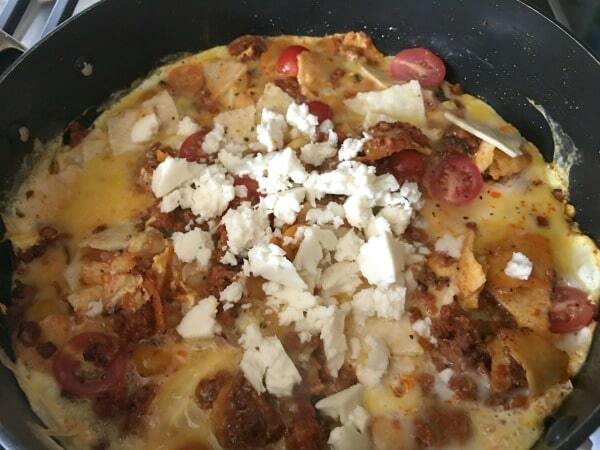 So back to this yummy migas recipe. How many of you know what migas are? 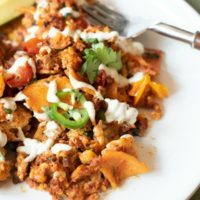 This chorizo migas recipe has easy ingredients that you can easily find at your local grocery store! Feel free to adapt this recipe and add to it. I often add chopped green peppers and other vegetables to change things up every now and then. You can even use the corn tortillas to make migas tacos out of the migas! 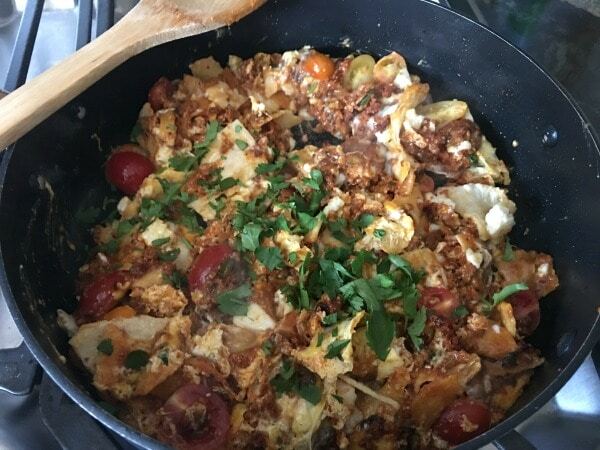 I chose to use Cacique® Panela Cheese in this migas recipe because it is mild and crumbles beautifully into this recipe. This cheese is fresh, so it will keep 3-5 days after you open it. First, chop up fresh cilantro, cherry tomatoes, and jalapeños. 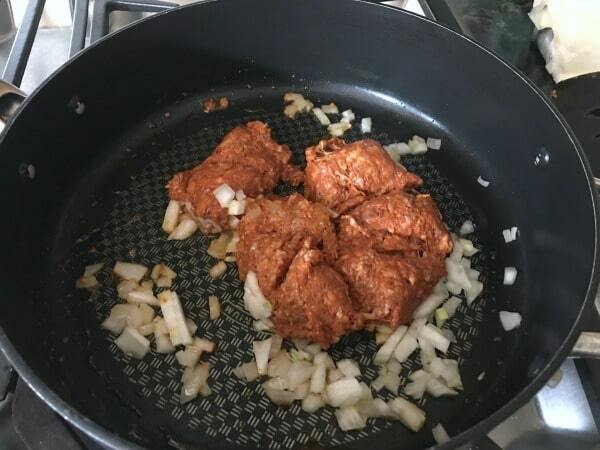 Open up the pork chorizo and add it to a pan with diced onions. Cook on medium heat until it is cooked. Add in the corn tortillas, egg, tomato, salt, and pepper. Cook on medium heat until the eggs are starting to cook. 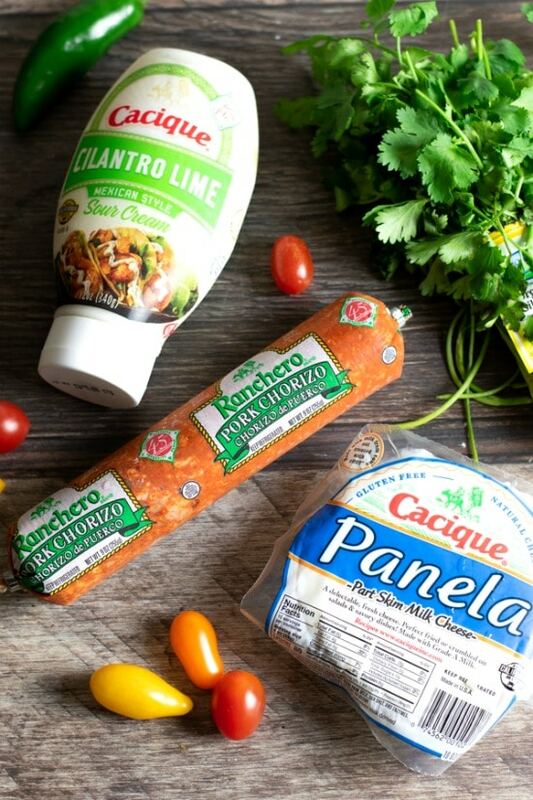 Add the Cacique® Panela cheese crumbles. Continue to cook until the cheese melts and the eggs are cooked. Add in the fresh cilantro and toss to cook it in. 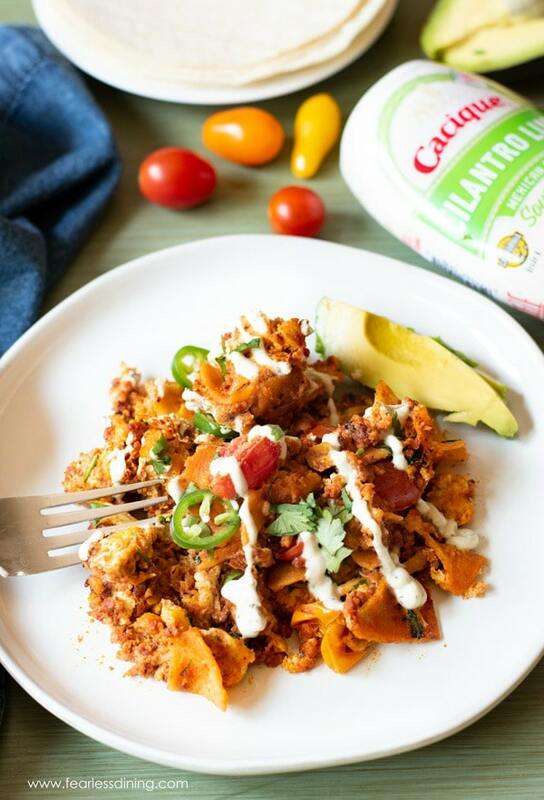 Serve it on a plate and drizzle Cacique® Cilantro Lime Sour Cream on top! Are you ready to make these for your breakfast? 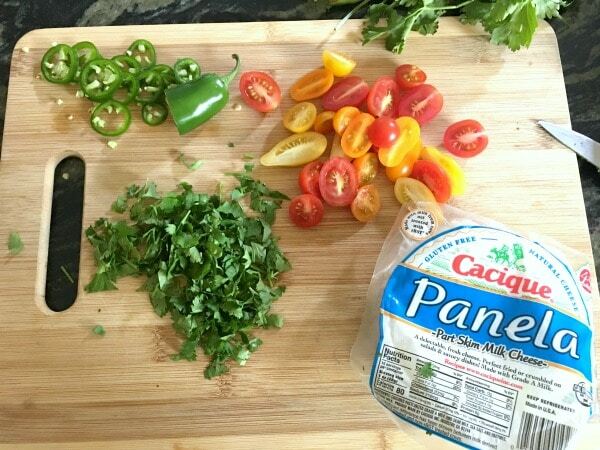 For another delicious recipe with Cacique® Cheeses and Chorizo, check out this easy White Queso Cheese Dip recipe! A hearty traditional Mexican breakfast that includes eggs, corn tortillas, and chorizo. Chop the cilantro, cherry tomatoes, and the onion. Heat a pan over medium heat and add the oil and onion. Cook for 5 minutes and add the chorizo. Cook until the chorizo is cooked, about 8 minutes. Add the scrambled eggs, ripped up corn tortillas, salt, and pepper. Cook until the eggs are part-way cooked. Add the cheese and finish cooking the eggs. Cook until the cheese is melted into the eggs. We make a variation of migas for weekend breakfast sometimes. It’s so good, and when you eat it, you never have those midday hunger issues – it sticks with you! Your version looks delicious. We will have to try it next time! 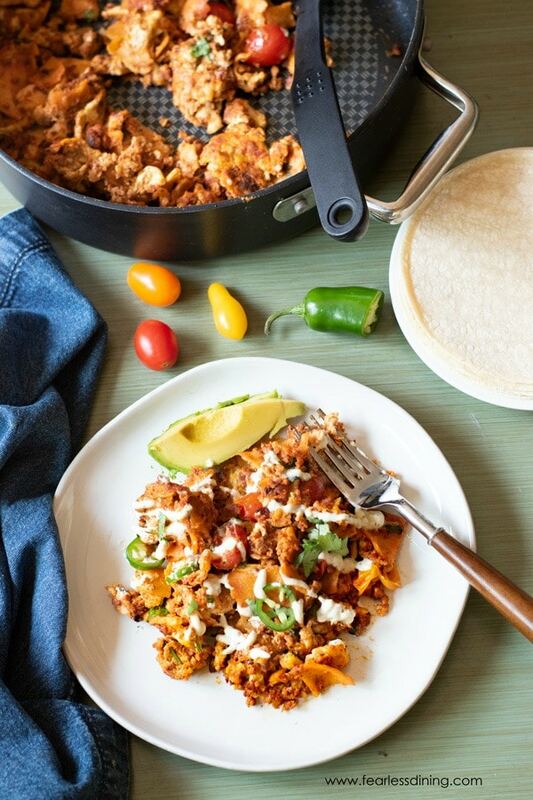 I recently found out about migas and would love to try this! Chorizo is so flavorful, and must go so well with the other ingredients. 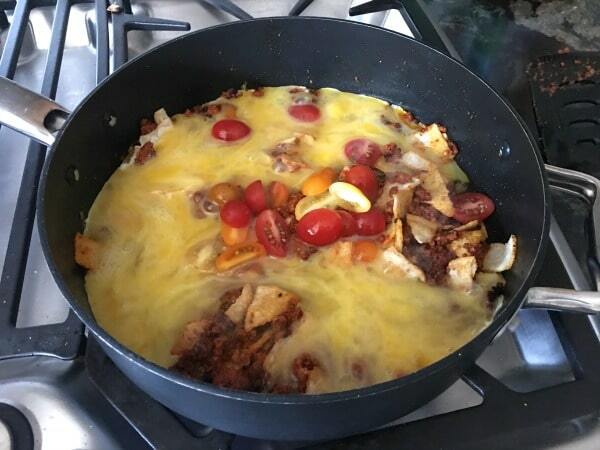 I am so glad you discovered migas, what do you like in yours? This looks like a weeknight meal that my family would love! I can’t believe I have never had migas! I definitely need to make them ASAP! I buy that exact brand of chorizo! 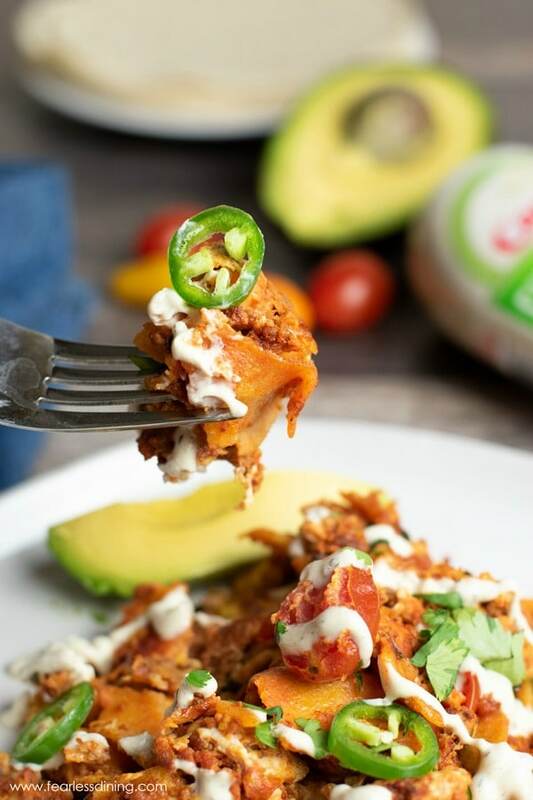 This is almost like breakfast nachos … I love it! I would even make this for a breakfast for dinner type meal. I love that you can get this chorizo as pork or beef so anyone can enjoy it. I’ve never even heard of Migas! Thanks for the introduction! I totally agree with your son that the chorizo is the way to go! LOL, he will love that there are more chorizo fans out there! Oh my gosh, this is the best Mexican comfort food! I can’t wait to make it again!